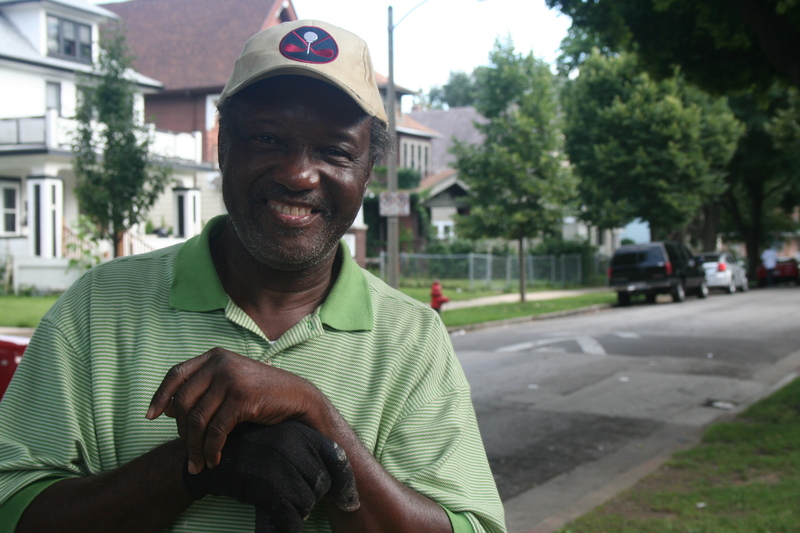 Lonnie Hughes stand just off the curb in front of his home in Sherman Park. He talks with a friend as he leans on the handle of a broom, his right hand covered by a tattered work glove. Though the block Hughes lives on now is a far cry from Jim Crow Mississippi, parts of it are oddly reminiscent of the old South where he was born and raised. He says there were positives, as well as the negatives. Lonnie says his mother and father didn’t complain about the situation they were in. Instead, they simply dealt with it, an attribute they passed on to their children. He says, in the long run, that type of approach and example made him a better person. It’s natural for people to feel bitter about how they’re treated or what they don’t have, he says, but learning to let go is important as well. Lonnie’s experience taught him to forgive. “If I’m gonna keep it in my heart and soul all the time it’s gonna build up a lot ‘a hatred and anger,” he says. “I have to give it to my family; my family, most of ‘em went to college, they prepared a way for themselves to be educated. You know, they didn’t feel that they had to depend on anyone — they worked hard,” he says. When Hughes came to Milwaukee for good around the age of 17 or 18, there were “plenty of jobs,” he says, a reality that drew many migrants to the city in the 60s and 70s. “You had the choice to work wherever you want[ed] to work,” he says. Lonnie drove a Milwaukee County Transit System bus for 37 years, originally settling in Sherman Park because it was close to the 35th Street station. He’s visited Mississippi, here and there, and says it’s good to “remember where you came from,” but Lonnie’s life is here, now. He raised three children in Milwaukee, and was able to send them to college on his bus driver’s wages. These days, he’s focused on continuing to set an example for his grandchildren. “You know, maybe one day … I could tell ‘em what I went through,” he says. What’s he looking forward to, at this point? Did you find value in Lonnie’s story? If so, please subscribe to our newsletter; we publish the story of a different Milwaukeean every week.